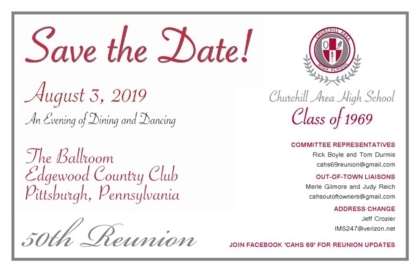 The Class of 1969 will be holding our 50 year reunion on 8/3/2019 at Edgewood Country Club. Please send your email address to IMS247@verizon.net to be included in further information as it becomes available. Based on your feedback from our previous surveys, your reunion committee is pleased to announce that the 40th reunion will be held at The Bar on Brown (635 Brown Avenue, Turtle Creek, PA 15145) starting at 6:00 PM. The event will be informal, with your registration fee (TBD) covering an appetizer buffet and non-alcoholic beverage. You will have the ability to order alcoholic drinks from the bar itself. More information, including final registration details, will be published later in the spring. We have chosen this date to allow as many classmates as possible to also attend the "All Churchill Class Reunion" on September 1st starting at 12:00 PM at Boyce Park. More details on that event can be found at this link. Plans are underway for "All Churchill Class Reunion" for Sunday, September 1, 2019 beginnng at 12:00 PM at Boyce Park. For more details, please visit the event website. Through the hard work of Mr. Lee Schaeffer, we now have a video recording of the CAHS Charger Football at North Allegheny from 1971. To see this video, please visit the "CAHS Athletics" link which should connecet you to a Dropbox file. We would love to have you join our site and share your information with all of us. Teachers who wish to join should go to the "Contact Us" tab and send an email with your name and email address. An account will be set up for you along with links as to how to complete the teacher profiles.